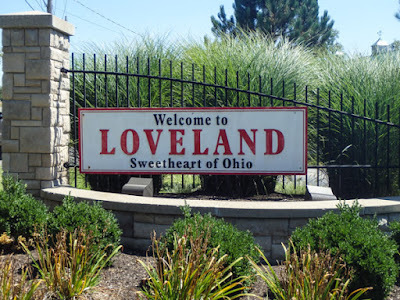 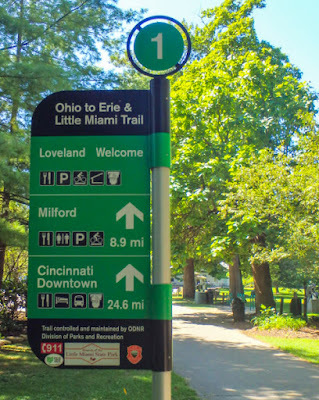 We slip a Monday morning ride on the Loveland Bike Trail into our family visit to Cincinnati. 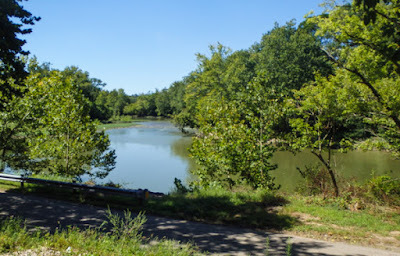 This is the location of our first bike ride together, and the location of our first bike club ride--our introduction to riding activities that we have continued to enjoy immensely over many years. The Loveland Bike Trail is built on the old rail bed of the Little Miami Railroad, running beside the scenic Little Miami River. Most of our ride is through verdant woodlands, beneath a shady green canopy of trees, with peeks at the river through the greenery. 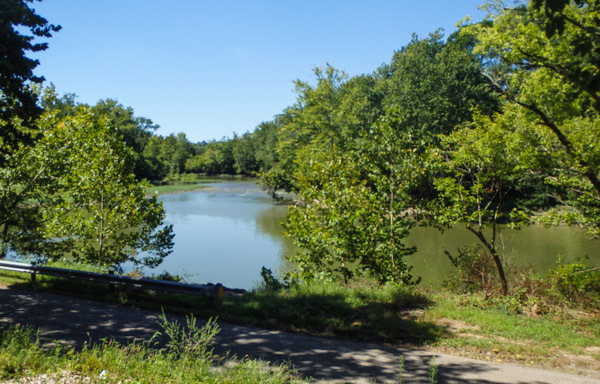 New since we last rode the trail fifteen years ago is a marker calling our attention to a trail-side home that was once an Underground Railroad stop--the Quaker couple who lived there sheltered and aided fleeing enslaved people. 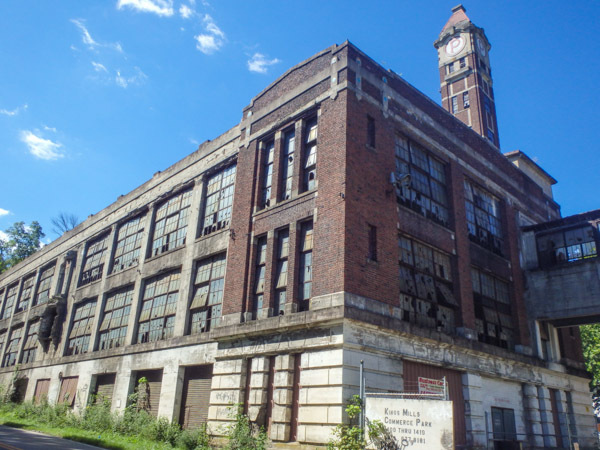 As we approach the Peters Cartridge Company, a landmark that traces its history from an 1855 powder mill at this site to military ammunition production in this building for both of the World Wars, we expect to find another historic marker. 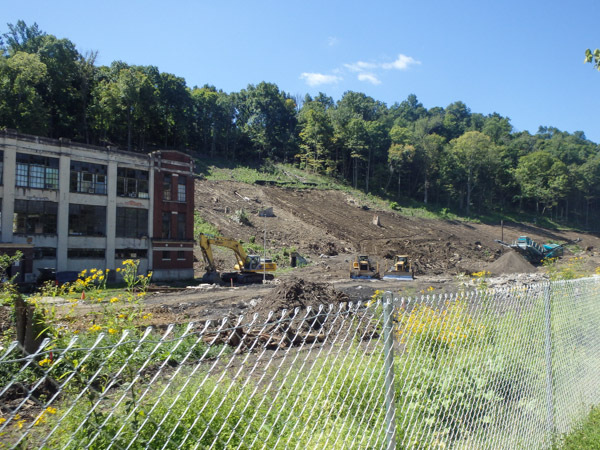 Instead we find bulldozers and other heavy equipment crawling all over the surrounding hillsides, and fences blocking access. Oops, it is now an EPA Superfund site undergoing remediation for copper, lead and mercury left over from its long ammo manufacturing history, but they don’t have a marker up to tell us this. 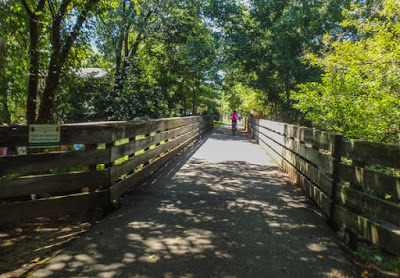 When we rode the trail years ago, it stretched just 13 miles, and today it is part of a trail corridor that stretches over seventy miles, with multiple side trail options along the way. As flatlanders, we love this proliferation of trails built on rail beds--if a locomotive pulling a long string of loaded cars behind it can handle the slope, we surely can. Which brings us to our ride around Pittsburgh the next day. 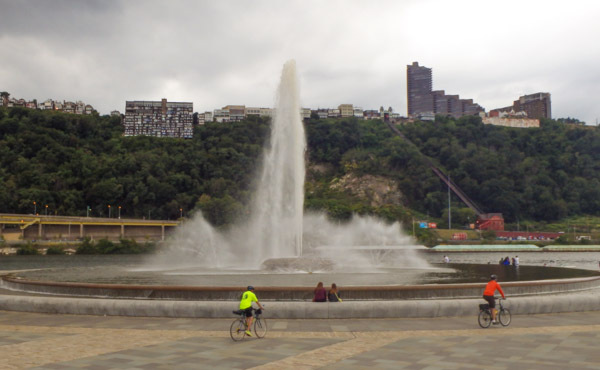 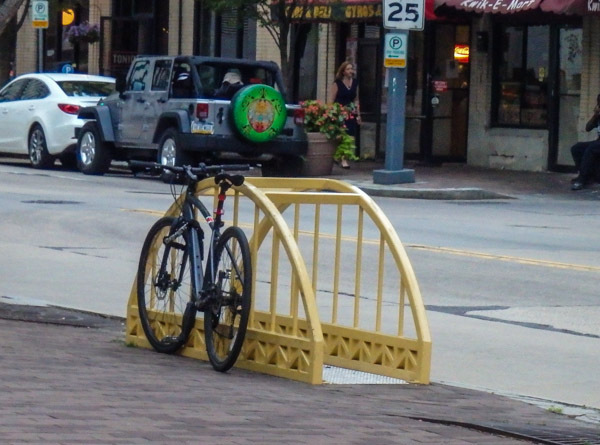 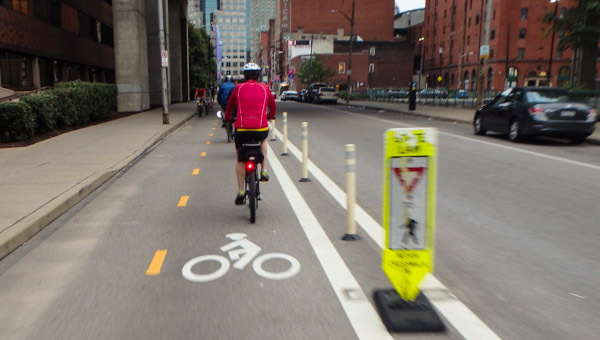 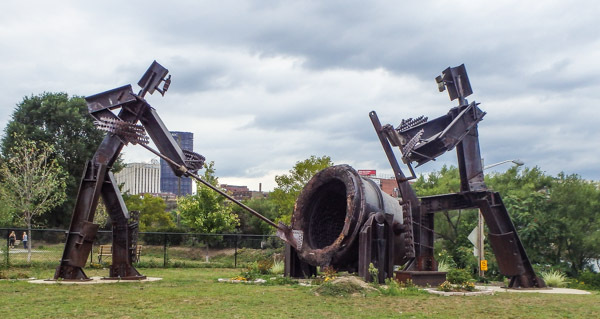 Amazingly, Pittsburgh is sort of on the way from Cincinnati to Rochester, and our travel week perfectly coincides with Pittsburgh’s weeklong Bike Fest celebration. 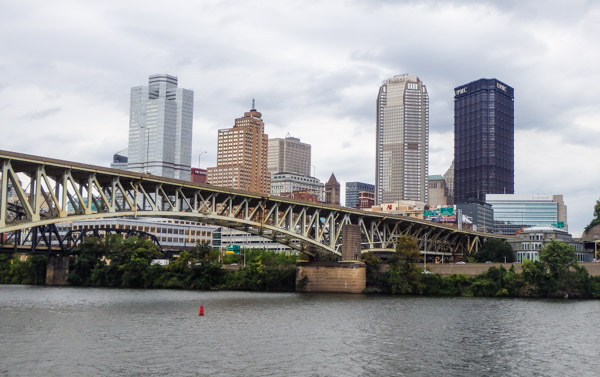 We make it to Pittsburgh just in time to check into our hotel, change into our biking togs and ride from our hotel through Downtown Pittsburgh rush hour traffic to the starting point of a free “Bridges in the Burgh” three hour tour. 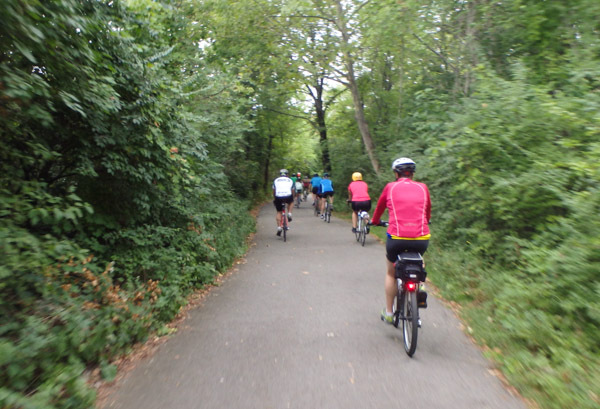 Our guide promises that 85% of the ride will be on dedicated bike paths, and it is. 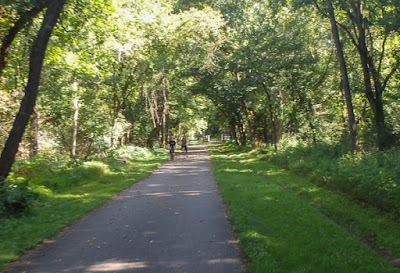 Most of the bike paths are converted from abandoned rail lines. eventually crossing over the river to arrive at The Point--the confluence of three rivers (the Allegheny, Monongahela, and the Ohio) where Pittsburgh was born. 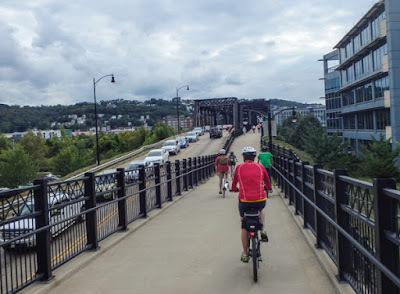 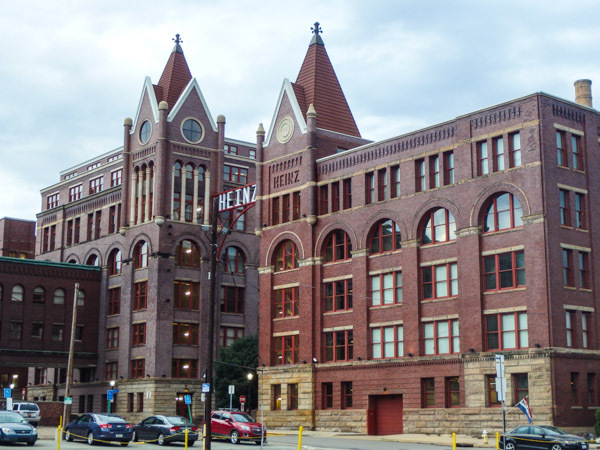 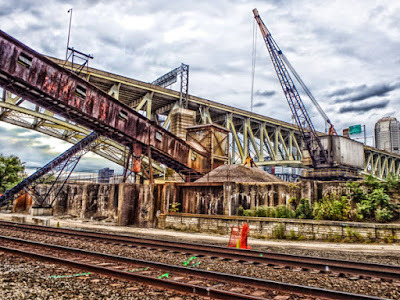 Then we bike a bridge across the Allegheny to see more bridges crossing that river, ending up at a beautiful old Heinz plant that is now converted to loft apartments. Our guided tour ends here, but we take yet another bridge across the river to get back to downtown Pittsburgh, which is very bike friendly, with lots of streets with bike lanes. 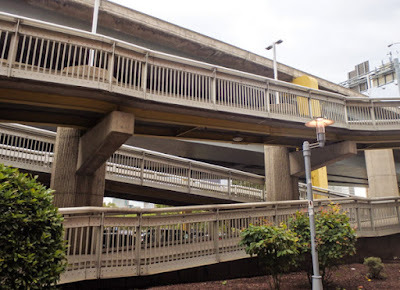 The one thing they can’t control is terrain, and there are some wicked steep hills in this town--including the one we have to climb to get back up to our hillside hotel! 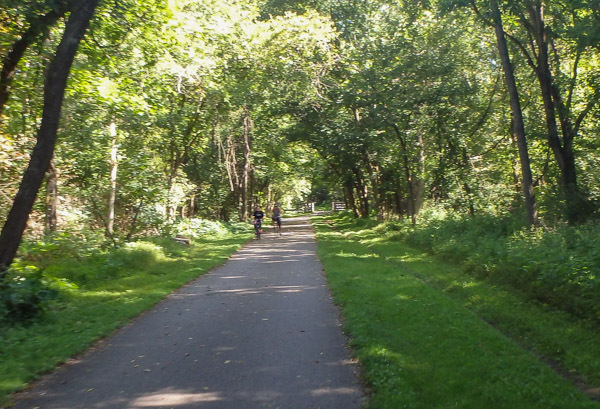 All the more reason to love those rail trails! 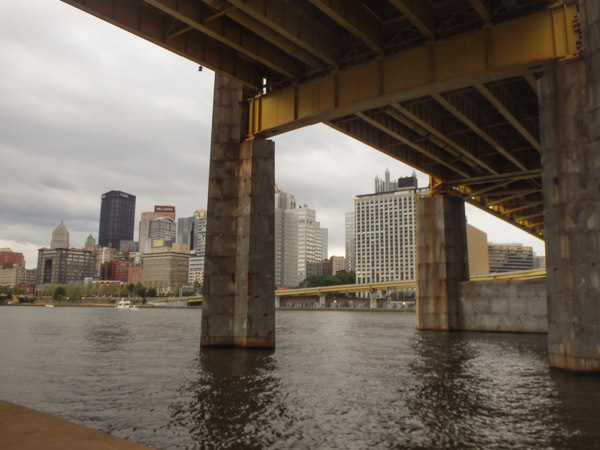 A few more pictures from our tour of Pittsburgh . . .